First Sentence: It was Charles who called us the parasites. I'm really not sure where to begin with this one, so we'll have to go straight in to the summary. Maria, Niall, and Celia Delaney are three semi-siblings. Maria is the daughter of their "Pappy" by some mysterious woman, Niall is the son of their "Mama" by some mysterious man, and Celia is the daughter of Pappy and Mama. Pappy is a famous singer and Mama a famous dancer, and the Delaneys' famous parents cart them around early 20th century Europe and basically neglect them. After Mama dies in a tragic accident, Maria goes to a theatre company in Liverpool, Niall goes to boarding school, and Celia continues touring with Pappy. But it seems to be during this time that their roles become cemented: Niall and Maria develop a confusingly intimate relationship, and Celia becomes her Pappy's caretaker as a way of avoiding her own life. 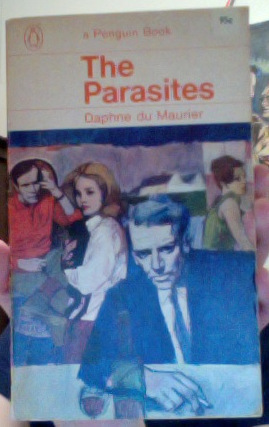 I've read two other books by Daphne du Maurier: Rebecca, which I think is her most famous one ("Last night I dreamed I went to Manderley again"), and The House on the Strand. I enjoyed both of those books a lot more than this one. Rebecca has a much stronger story, and The House on the Strand has much stronger themes. The Parasites, meanwhile, just sort of is. Maria and Niall aren't very likeable characters and although I found Celia a bit better, she's clearly just sort of a doormat. Furthermore, I found the relationship between Maria and Niall to be really creepy. These are two people who were raised together but apparently (?) become physically intimate at some point. I'm pretty sure there's something in attachment theory that says that that shouldn't happen. (It isn't on the scale of Francesca Lia Block's Wasteland, or anything, considering that Maria and Niall are aware that they're stepsiblings throughout their lives, but still, ugh. Wasteland was oddly less creepy, in some ways.) Of course, this has everything to do with their characterization as parasitic, but it wasn't fun to read. The book wasn't all bad or anything by any means. There are quite a few good secondary characters, and the scenes between them and the Delaneys can be quite good. Pappy is great, and so is Niall's sugar mama, Freada. But this definitely isn't a must-read, and I'd recommend Rebecca long before The Parasites.